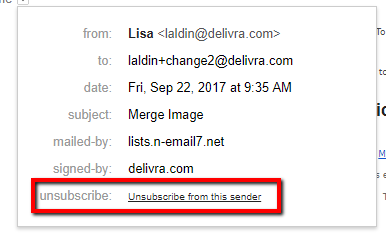 The system automatically adds a list-unsubscribe header to your sent campaigns. To check, you can send an email to your Gmail from our system (or check a previous received email from the system). Once opened, click the drop down next to the recipient name: (it will say "show details" if hovered over). We don't recommend actually unsubscribing from your own mailing list unless you are using a purely test email.